In this review of the Sunny Air Walk Trainer, we aim to give you an in-depth overview of the machines features, specifications, construction, design elements, and more. An elliptical can be a fantastic way to get a good low-impact full-body workout. 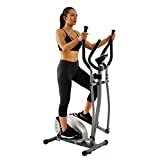 The right elliptical can provide you with both cardio and muscle workouts simultaneously without damaging your joints or wearing out your workout shoes. 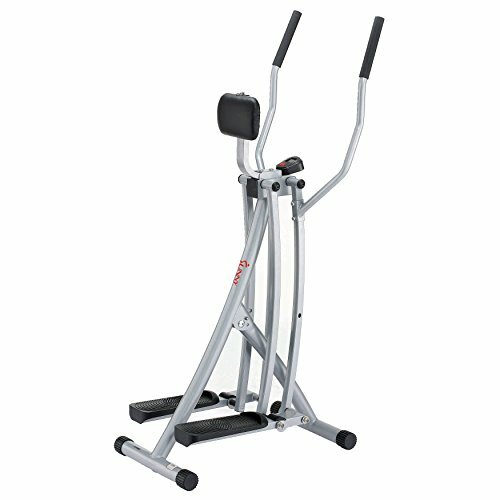 The Sunny Air Walk Trainer can be used by anyone in good health and is great for saving space in your workout room. It’s easy to fold and store and is also surprisingly lightweight. Durable construction makes it fine for daily use while soft foam padding and non-slip foot pedals make it easy to operate. An LCD monitor helps you stay motivated and track your workout progress. It has received many good user reviews and seems to be a great value for the money when compared to competitors. Below, we will take a look at all of its details and specifications. This trainer is a great way to achieve a full body workout easily and gently. It features non-slip foot pedals that simulate the way your feet would grip a sidewalk minus the joint impact. Move slowly or work your way up to a full sprint at your own pace. Continuous full range motion is fluid and comfortable. Such an air walker helps you focus on muscle groups that machines like a treadmill just can’t target. You’ll be in an upright position that works your core as well as your legs, glutes, arms, calves, and more. You can work your way up to faster speeds to improve your health and endurance as well. 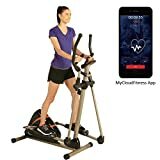 This makes it great for new users or those who want to get into better shape and either aren’t able to or don’t want to use a treadmill for aerobic exercises. Lightweight yet durable materials make it easy to move if you need to save space. It also folds to half of its size very easily. 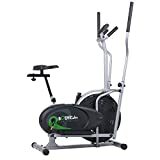 All in all, it’s a great machine for anyone who wants a good cardio alternative to a treadmill or heavy electrical elliptical. There are many routines that work well with this machine. You can take your time and workout at a steady pace for a long and simple endurance workout, or sprint outright for a quick cardio and calorie burning option. We recommend a combination of both. Making your heart rate accelerate, holding it steady, and then resting, is a great way to achieve maximum calorie burn. For the perfect 20-minute workout, start at a slow and comfortable warm-up pace for 5 minutes. Increase your speed to get your heart going for about 3 minutes, and then “sprint” for 2 minutes. Come back down to a medium pace for 3 minutes, and then spring again for another 3 minutes. Add 2 minutes at a medium pace, and then cool down for 2 minutes. Using this method, you can increase your “medium” and “sprint” speeds by tracking them on the monitor over time. LCD monitor, soft foam handles, and grippy foot pedals. Maintenance: This machine is very easy to maintain. Wipe it down after use, and remember to change the LCD monitor batteries when necessary. Warranty: Limited product warranty is included from most sellers. Accessories: Foam hand grips, LCD monitor. Lightweight – Lightweight construction makes this machine easy to move and assemble. Durable – Durable material construction means that you can use this machine daily. It is designed to last for a very long time. LCD monitor – Battery operated LCD monitor helps you track your progress and stay motivated. Smooth motion – A smooth full-range elliptical motion makes workouts comfortable and fun. Good grip – Soft foam grips on the handles and good traction on the foot pedal help you to get a comfortable and firm hold when using this machine. Impressive value – This machine is a great value for the money, especially in comparison to some similar products. Low resistance – This machine may not provide enough resistance for some users. Foot pedal complaints – Some have complained about the size and quality of this machine’s foot pedals. It can be helpful to know what other customers think about a product. The Sunny Health Air Walk Trainer has mostly received positive reviews. Below, we have included a few of the most helpful user reviews that we have found so far. In conclusion, this machine would be ideal for anyone wanting a good cardio machine in their home gym. It’s pretty inexpensive all things considered as well as easy to fold and store.